Thank you for your donations. Our customers saved a total of $814 in exchange for 1385lbs of food items for the Food Bank. Way to go!!! In more news, Wright’s Cleaners was voted the best Dry Cleaner in Barrie in 2014. 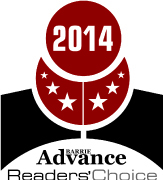 Thank you to all the readers of the Barrie Examiner for placing your vote and confidence in our staff and service.